John Robb has been actively practicing law since 1978 when he joined his father as a third generation lawyer in Newton. John's practice is concentrated in estate planning, including wills, trusts, estate tax and probate and he also handles many business-related matters in the legal arena for clients. An active school attorney, John has distinguished himself in the area of school finance litigation and negotiations as well as day-to-day advice for school administrators and Boards. John is an AV 5.0 Preeminent peer rated lawyer by Martendale-Hubbell, their highest rating. He carries a Superb rating from AVVO. He has been designated a Super Lawyer in Super Lawyer Magazine and has been honored with a listing in the Best Lawyers in America guide. After growing up in Newton, John attended Kansas University and you'll find that he's still a loyal Jayhawk fan. John has a continuing interest in business issues and puts his undergraduate degree in Business Administration to use frequently for clients and in his civic activities. Serving regularly on various local organization Boards and particularly finance committees has been a real pleasure. Always active, John has served as President or Chairman of the Newton Area Chamber of Commerce, the Harvey County Jobs Development Council, The Greater Newton Foundation, the Newton Jaycees, the Kansas Jaycee Cerebral Palsy Foundation, Northview Developmental Services, Inc., the Harvey County Bar Association and Harvey County Ducks Unlimited. He's also been active on the Boards of Mirror, Inc. a comprehensive alcohol, drug and corrections entity, the Florence Bessmer Foundation, which financially supports the Newton Public Library, the Frazey Foundation, the Goddard Education Foundation, Bank IV Newton, Harvey County United Way, and the Newton YMCA Advisory Board. 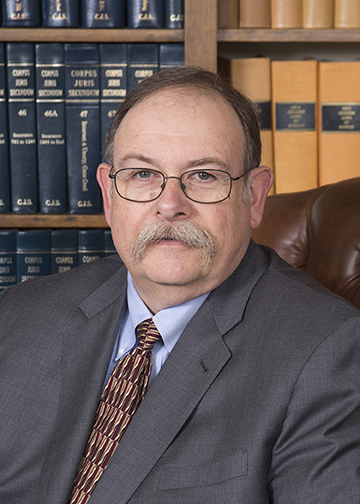 His other affiliations include The Harvey County, Wichita and Kansas Bar Associations, the Kansas School Attorneys Association, the National Council of School Attorneys, the Ninth Judicial District Nominating Commission, Sigma Alpha Epsilon Fraternity, Alpha Kappa Psi Business Honorary and Phi Delta Phi Legal Fraternity. He's also been active in a number of local office political campaigns. Being named an Outstanding Young Kansan, receiving the Newton Jaycee Distinguished Service Award, the Ducks Unlimited Conservation award and being named Newton Kansan Newsmaker of the Year are all honors John has received. In 2003 John was named Newton’s Outstanding Citizen of the Year by The Newton Area Chamber of Commerce. John was named one of Wichita's "10 to Watch" by the Wichita Eagle for 2010 in regards to his school finance litigation efforts. John was the second recipient of the national Demetrio Rodriguez Champion of Educational Justice Award presented annually by the Education Law Center in New Jersey at the Litigators Educational Opportunity Conference. The award is presented for lifetime career achievement in advancing equal educational opportunity through school finance advocacy. After graduating from Washburn Law School with honors, the return to Newton was natural for John and his wife Karen who is also a Newton native. When schedules allow, they love to spend time with their three daughters and their husbands, Jenny and Aaron Beck, Katy and Matt Jaska and Suzy Robb. As you'd expect, they keep very busy with their grandson, Harrison Robb Beck, and on weekends you might find John enjoying his Mazda Miata or sitting in a duck blind.